Why should you utilise this clever design idea in your garden? 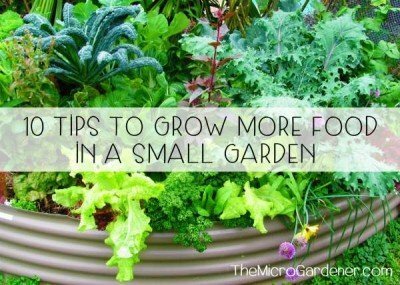 Because, no matter what size your garden is, I firmly believe you can improve the productivity, beauty and functionality by maximising vertical space. Simply put, vertical gardening creatively utilises a structure to maximise the growing space and exploit the potential of both the vertical and horizontal planes. 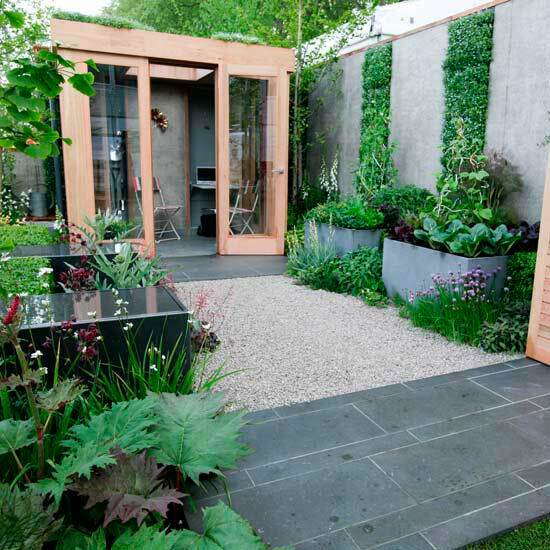 Think outside the square: 3D gardens with colour, shape and texture not just flat designs! 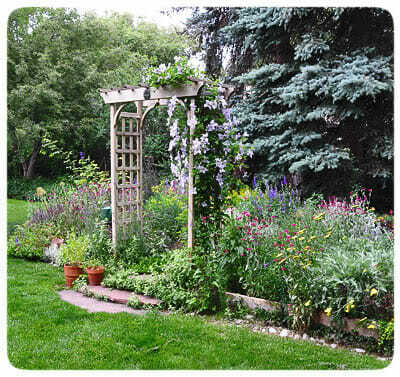 Traditional in-ground garden beds have very limited potential. However, growing ‘up’ or ‘down’ and ‘stacking’ techniques provide you with loads more options. Emily’s garden here has many vertical solutions in a tiny space. 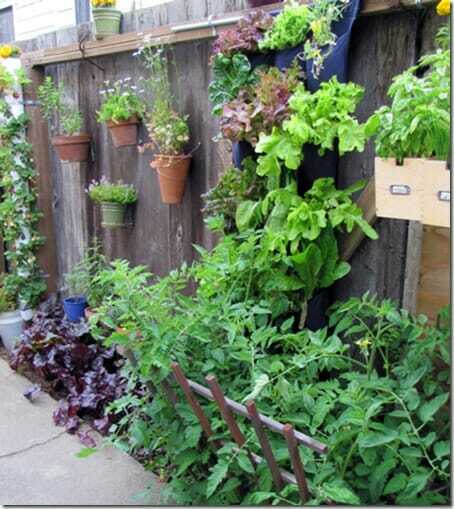 Above a narrow garden bed, pots hang on the fence, a pipe has become a strawberry tower on the left, herbs fill repurposed drawers on the right and the pockets of a blue shoe organizer house an edible salad garden in the centre. makes gardening more accessible for those with health or mobility challenges. 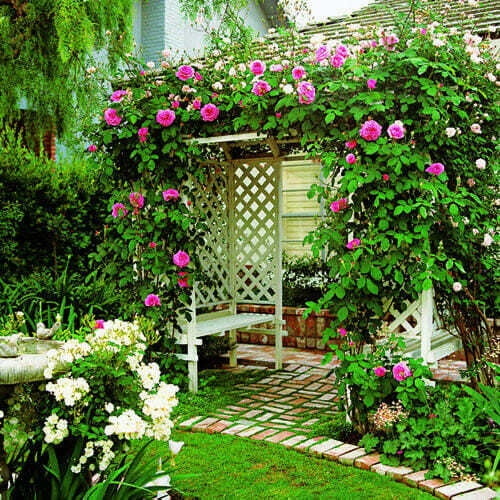 Clever use of an arbor in this garden room with seats below cascading roses, not only makes it a fragrant place to relax but draws the eye into the small space and creates a sense of mystery beyond. 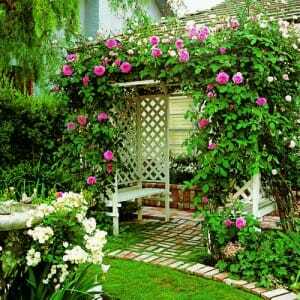 There are many different types of structures and trellises you can use. 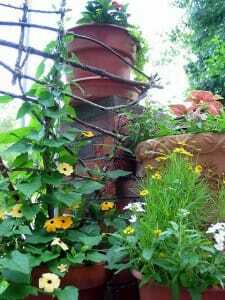 Vertical structures are used efficiently in this garden: hanging baskets at varying heights, a wall-mounted trellis, pots stacked on a bench, stake in a pot and a clay pot with strawberries in vertical pockets. Those that are stackable, allowing you to layer plants. 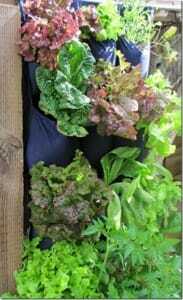 This post features ‘bottom-up’ vertical garden planting options for you. 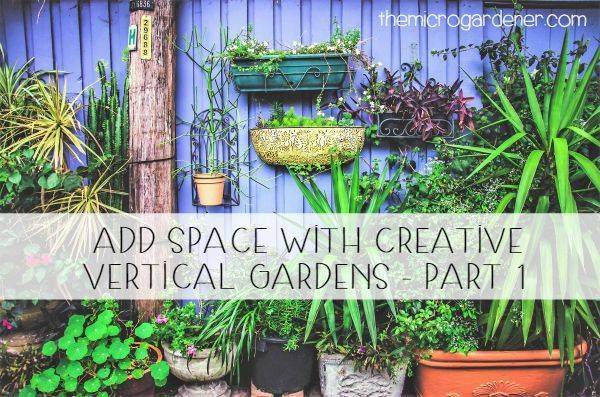 Check out more vertical garden space solutions in Part 2. 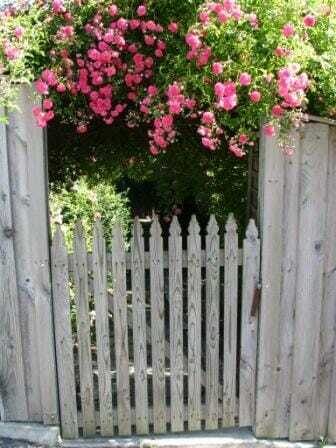 This rustic handmade trellis lends character in a cottage garden with layers of colourful climbing flowers. Usually lattice or wire frames or similar structures. Often made from timber, metal or plastic. These are generally supported on a fence, wall or building. 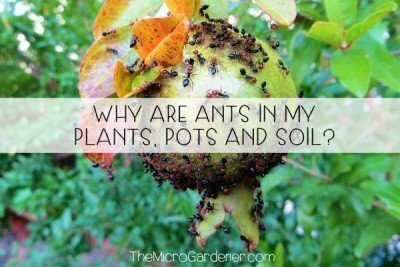 They can also be added to a raised bed or planter box. 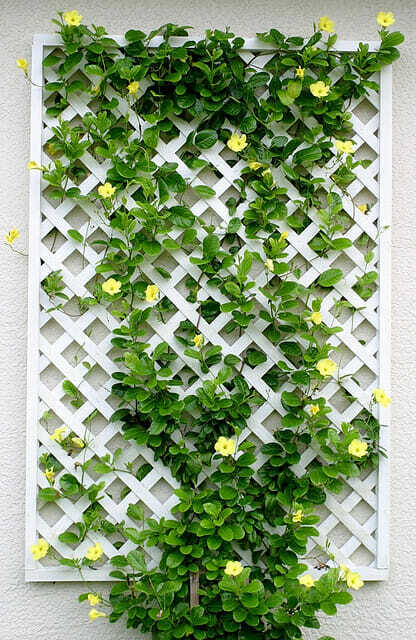 A simple white timber trellis installed against a wall becomes a focal point for a colourful climber. Boring exterior wall spaces can be divided up and made more visually appealing by including a vertical garden structure. Here an A-frame is in the form of a mini ladder made from two timber frames with slats tied together with rope at the top. They are used to grow climbing legumes. A-Frames can also be used over a garden pathway to create an arbor and take advantage of air space that would otherwise be wasted. 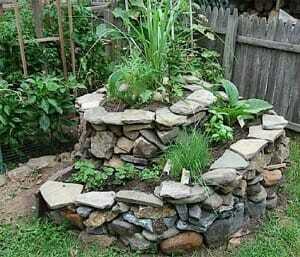 This idea is also an attractive garden feature. 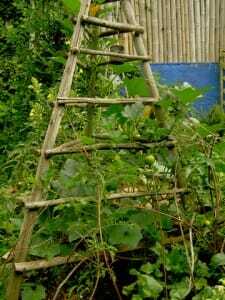 Are a one-sided trellis, positioned at a low angle to the ground. They are held up by poles going in the opposite direction. 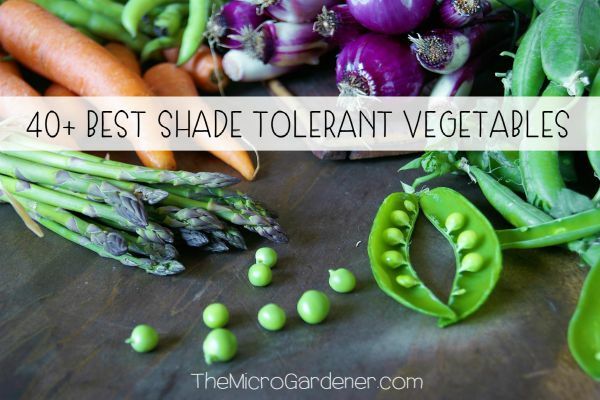 You can also grow shade-loving plants in the shady microclimate underneath. This allows you to take advantage of the shade produced by the plants growing on the lean-to. 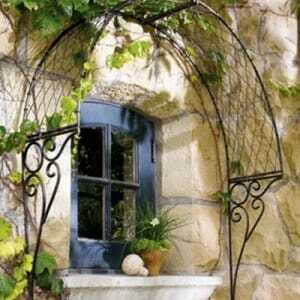 A wrought iron arch lends loads of character to this house and frames the window with a soft creeping vine. Both a decorative design feature and great use of vertical space. These are multi-functional structures that provide a focus and attractive design feature in the garden. They also increase your vertical growing space. Positioned correctly to draw you through and beyond, they can also create a sense of mystery and interest to the garden design. 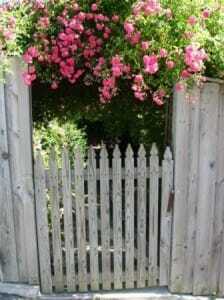 This cute entrance gate has loads of eye appeal with a cascading arbor of flowers. An invitation to walk up the garden path! Want to enhance the ‘curb appeal’ and add value to your home? Try adding an inviting arbor or arch at the entrance. They add loads of character and are almost irresistible to the eye. 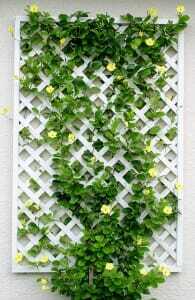 Walls are the perfect framework to support trellises of different kinds and attractive garden art. Wall pots are semi circle shaped, with one flat side for fixing against a wall. 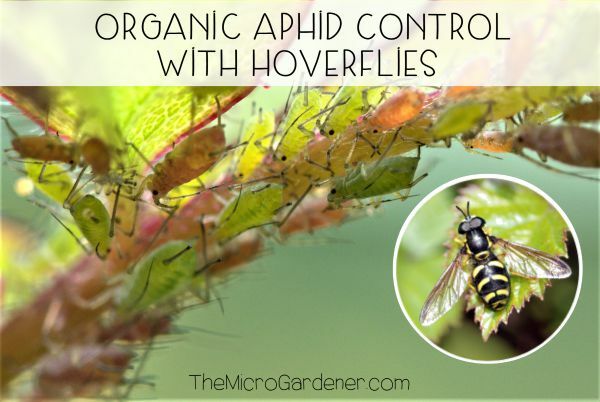 Due to their compact size, they won’t hold large plants and are best suited to succulents. Unattractive walls or those that reflect too much heat, can be turned into living green walls to cool a space or disguise the surface. Planting ivy or a creeper and adding a little garden art makes this vertical space a feature in itself! An often forgotten and unused feature of the garden, boundary fences provide valuable ‘wall space’. 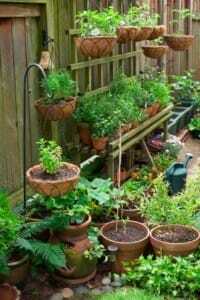 You can hang trellises, planters, wall pots, baskets, garden art and even brackets with shelves. 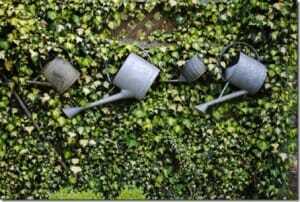 Unattractive fences can also be hidden with a living green wall or splash of colour. A close-up view of the shoe organiser lettuce garden above that was hung in Emily’s garden on the fence. This concept makes great use of a garden boundary utilising precious vertical space. 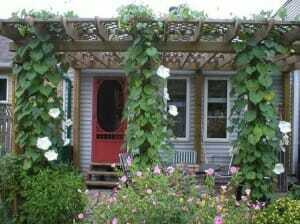 Balcony, verandah and deck posts can be softened with a climbing plant that gently winds around, creating an attractive feature. 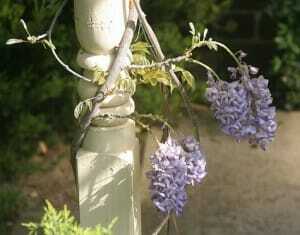 Lavender coloured wisteria is a stunning climber to soften or highlight vertical posts, columns and railings along a verandah. Tall trees like mature palms with straight plain trunks provide another opportunity for climbing plants to grow vertically. Sweet corn stalks and okra both have strong stems. 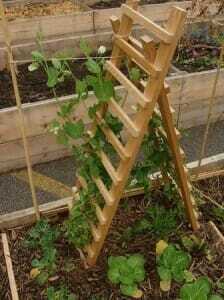 They can also be used as supports for growing edibles like pole beans, cucumbers and other climbers. Tepees and tripods can be made for little cost if you reuse strong branches like gum. Tripod’s like this one in Jane’s Delicious Garden are perfect to grow vegies. It’s strong, durable and a practical solution to limited space. Tepees or tripods are made with three or more long narrow poles (e.g. bamboo, wood, plastic or metal). These come to a point and are often supported with lashing (string, baling twine or wire) near the top to form a pyramid. The poles of the tepee are splayed apart until it is self-supporting. It can be strengthened with regularly spaced horizontal poles or twine for further support. Then position in a pot, the soil or a raised bed. Learn how to make your own tripod at Jane’s Delicious Garden. Whilst it is quick and easy to make your own bamboo tepee, there are many low-cost structures made from plastic that are suitable for small containers like pots. These are durable; easy to collapse and store when not required; and can be reused many times. These are the simplest form of vertical gardens. They are just inserted in the ground or pot and used with a soft garden tie. Overhead structures supported by timber or metal upright posts. They can be multi-functional, not only providing shade and beauty but also vertical space for climbers – either in the ground or in planter boxes. Hanging baskets can also be hung from horizontal rafters. Frame a space like this outdoor room with a pergola covered in stunning moon flowers. Named for their habit of opening early evening and flowering at night, they also have a delicate perfume. A great choice for an entertaining area. External walls and rooves are being used more frequently as growing areas to optimise urban space, insulate buildings against heat and provide shared community rooftop gardens. This tiny urban courtyard is a great example of layering. A living green roof and vertical wall garden are complemented by raised planter boxes with tepees. These design clever ideas maximise space without feeling overcrowded. Strawberries and other herbs and edibles are grown in a simple vertical pipe system filled with soil and planted in holes up the sides or terracotta pots with ‘pockets’ for planting. 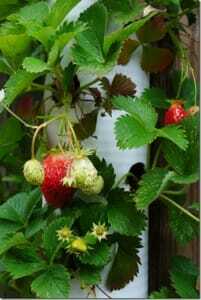 Close up of a vertical plastic pipe tower garden filled with cascading strawberries. Holes are cut in the sides of the pipe and seedlings planted into them. The tower is watered from the top down. Pyramidal frameworks customised for use in the garden, generally with three or four legs and reaching a point at the top. Many are stunning garden features in themselves providing vertical dimension and a focus for the eye. They are well suited to growing attractive flowering climbers. Herb spirals are a clever design system, most commonly used in Permaculture gardens. This vertical garden design imitates a spiral, much like the shape of a snail shell. The design maximises the edge and a wide range of herbs can be grown in microclimates, ranging from hot and sunny at the top to wet and shady at the bottom. Herb spirals are both an attractive garden feature and designed to maximise planting space while minimising water use. 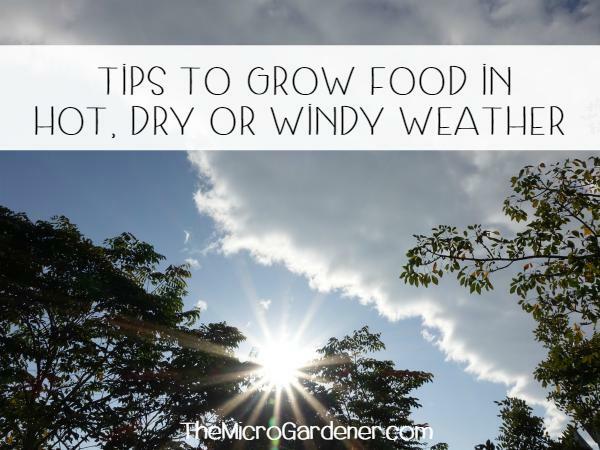 Thirsty plants are located at the base to soak up moisture that percolates down from the drier zone at the top. There are many ways you can use plant cages. Some are filled with soil at the base and then planted with potatoes. Then covered with more compost or straw mulch as they grow. Others are like the ones below, sitting on top of the soil or pots to contain the plants as they grow, providing them with an internal climbing frame. 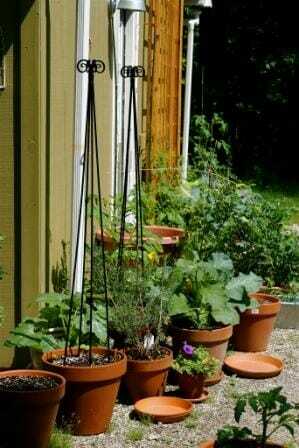 Wire cages are a compact, frugal design idea for micro gardens. 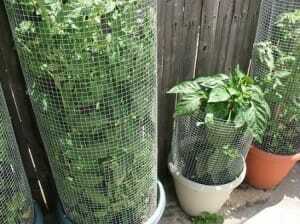 These plant cages are on top of pots with fine mesh to keep animals and birds at bay. They keep the plants neat, tidy and contained as they grow in a compact space too. A trelliswork made from horizontal wire, usually flat against a wall or between vertical support stakes. The branches of the fruit tree are trained to extend horizontally and tied to wires or hooks in a variety of shapes (the most popular, a fan). Many urban gardeners don’t realise they could be growing abundant fruit in their micro backyards using the espalier technique. 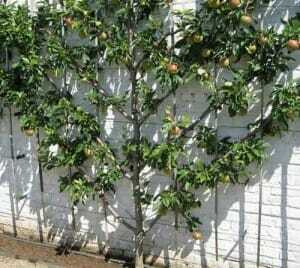 Here an apple tree is trained up in a fan shape which is both a feature and a productive edible garden. Espaliered trees have a more formal, symmetrical shape and despite the minimal space required, bear more fruit, earlier and for a longer time. Vertical branches grow leaves; horizontal branches grow fruit. This clever technique should be used for a bountiful harvest in all micro gardens! 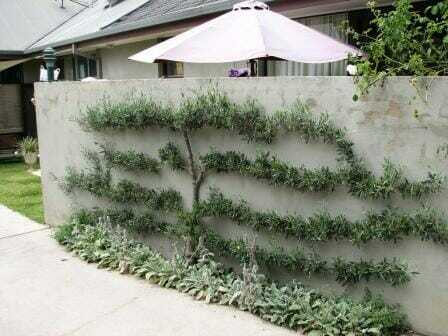 This garden makes clever use of wall space growing an espalier olive tree for delicious fruit in season and under planted as a feature and for weed control. 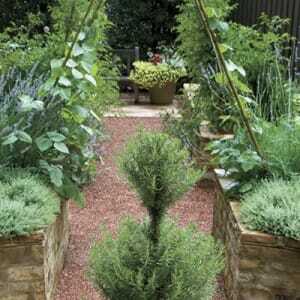 Planting horizontally also makes the wall space seem longer in a compact garden. Watch this really practical video on ‘Growing Vertically in Small Spaces – Examples of Vertical Gardening Trellis Methods‘ as John from Growing Your Greens visits a local community garden and shares with you some excellent examples of vertical gardening in the real world. Want to save space with more vertical garden options? Find out more vertical garden solutions to grow plants down and using stackable planters in Add Space with Creative Vertical Gardens: Part 2. For more ideas and tips, read 12 Reasons Why You Should Garden Vertically and 15 Helpful Design Tips for Vertical Gardens. You can find more Clever Design Ideas in the Container Gardening category. © Copyright Anne Gibson, The Micro Gardener 2010. https://themicrogardener.com. All rights reserved. Our resource lists 101 informative sites on wood use for your readers to check out. We want to share our resource with you because we think your readers may benefit from it, and we believe it would make great content for your site as well. Thanks for sharing your link Alyson. All the best.